The mini-golf ant is fake, or is it? My mother’s father was a solid, responsible grandfather when it came to driving a nail straight, shooting a flawless game of pool, and finding where the fish were hiding in the river. He worked as a farmer, an auditor and a car salesman, so he knew a lot about the practical nuts and bolts of the world. He also knew what was wrong with it and what was dangerous, so he was among my childhood protectors and instructors. He also saw the humor in the unexpected, lurching out of dark shadows at night, playing practical jokes, and becoming a conspirator in the wild, imaginary tales my two brothers and I cooked up. As a fan on tricksters in myths and legends, my first lessons in combining fact and fiction, the sacred and the profane and the practical and the ludicrous came from my Grandfather Gourley. As a child and a young adult, I simply saw that Grandpa liked making people laugh. Now, I wonder if he had somewhat of a trickster’s mindset: that is, creating the laugh as part of a learning experience? In my novel The Sun Singer, my Grandfather Elliott character—who has as lot in common with my grandfather—is the one who stirs things up. Since my novel is an adventure story, Elliott’s grandson Robert gets into some dangerous situations because things got stirred up. Needless to say, Robert’s parents aren’t pleased when things get stirred up. After all, they expect grandfathers to serve as wise protectors. My grandfather lived in Illinois. I lived in Florida. So, for many years I only saw in on vacations. Ultimately, he and grandmother moved to Florida, finding a house about four blocks away from us. My parents liked the arrangement for all the usual reasons about having family close rather than far away. I wonder, though, if my parents noticed that after grandfather came to town, things got stirred up more than ever. My mother often told stories about the practical jokes her father played on her when she was a kid. So, she had to know that having Grandfather Gourley in our neighborhood was somewhat like having a coyote or a fox in the hen house. When things went nuts, Grandfather acted innocent like he had no clue what could have possibly caused the latest hijinks. From him, I learned how to keep a straight face while household weirdness played itself out. While visiting my granddaughter last week, who is still very literal when it comes to the meanings of things said and done, I quite naturally felt a need to protect her from all possible harm and unpleasantness. 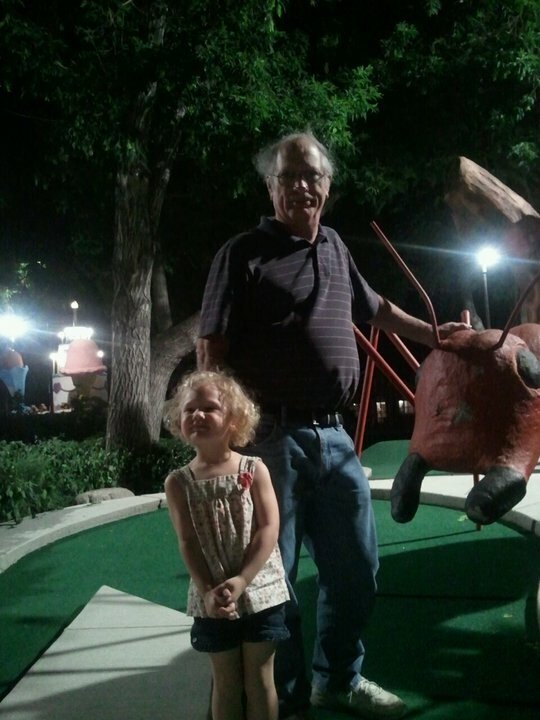 Yet, I also began my sacred task as a grandfather: working on getting her more acquainted with the figurative. (In small doeses, of course.) My grandfather helped teach me about humor, magic, and the benefits of managed chaos. That’s a tradition I want to continue. The most recent edition of my hero’s journey mountain adventure novel The Sun Singer came out in March 2010 in paperback and Kindle formats. I have been revisiting the novel during the last few months to make sure my Sarabande sequel is consistent with the large cast of characters and mysterious plot. Many of my favorite characters from The Sun Singer are returning in Sarabande. I must be careful not to accidentally change the color of anyone’s hair, mix up who did what, or forget who the traitors and heroes were in the original story. I Need a Sun Singer Encyclopedia! I’m using the search feature in Microsoft Word a lot these days. When Gem or Dohver or Robert show up in Sarabande, I search for them in The Sun Singer. I’ve done the same thing for every character because I’m just not organized enough to have a “master notebook” with an alphabetized list of characters, traits, nastiness level, date of birth and eye color. Voices. Voices ahead of him on the trail, as yet indistinct. He crouched down and waited. If it were a search party, he’d just have to hang his head, like Arnold’s puppy when it was caught on the couch, and admit that he was wrong to hike alone and stay out so late. Yet, if he did step through a door into another world, what then? He hid his pack in the underbrush and crawled forward. He found every dry twig in the forest, and every one of them cracked in two as though he were chopping firewood in front of a microphone. Where was brother owl’s hoooo hoo-oooo, hoo hoo and the wind and the rain when he needed some covering noise? The earth was cold to the touch. An arm wrapped around his neck, choked him, and pulled him over onto his back. That dream! He knew what was next. The boot slammed into his stomach and the dirty rag shoved in his mouth blocked his weak protest. His hands and feet were bound with a heavy rope. “Over here. Gem.” A woman’s voice—the word in his dream notebook was a name?—and obviously no one from the hotel out to rescue him. Sonny saw nothing. His captor had the eyes of a cat. Or, with the ability to operate so efficiently in the darkness, was a cat. The night moved in front of him and four hands pulled him up on his feet, then hoisted him into a mid-air prone position. They carried him down the trail in the direction he had been heading. After taking a few steps, they were breathing heavily. A spy? Spies were always stabbed at night or shot at dawn. Robert Adams said he heard a blue dove calling through a doorway. Yeah, for the hapless Sonny Trout. In ten minutes, the night gave way to a small campfire. They set him down roughly, several feet away from it, and the heat felt good. The light transformed his captors from gasping apparitions into flesh and blood women. One wore a brown, leather dress. Her hair was black and twisted into long braids. The other was shorter, younger, and wore dark green trousers and a flannel shirt. She perspired heavily. Her shoulder-length hair was fiery red, tangled and matted to the sides of her face. She paced in front of the fire, catching her breath. Finally, she stooped down in front of Sonny, turning up her nose in disgust as though she were looking at a helpless bug lying on its back. Then she laughed. In the manuscript for my sequel, Robert Adams is talking to Sarabande some 1,600 miles away from the Lake Josephine Valley in Glacier National Park where this scene from The Sun Singer occurred. I found myself reading it to remind myself what Robert’s firrst reaction to a stressful situation was like. He’s in one right this minute in Sarabande, and I better get back to it before I forget the details I just read. When they entered a wide meadow which looked as fluid as water in the pale light, Sarabande ran past them, her waist-length hair streaming out like a flag. “Grinder,” she said, in a rush of air, more wind than voice. Sonny dashed through an obstacle course of boulders and fallen trees. His boots filled with water from unseen puddles. Thorns bit into his exposed skin like spurs. He swung his staff at the offending briers, and ran, was running—now, he was angry and unchecked. Running—there was Marten, and Marten saw him and punched the air and laughed and shouted with more breath than volume, “Hoo-eeee, hoo-eeee.” Running—“Hoo-eeee, hoo-eeee,” he shouted back and ran harder, pounding down the earth. Running—soon they would turn, soon they would fight, and his heart pumped primal fears, brutal and exhilarating, and they coursed through him on rivers of fire. The day would end in fire. He knew this as he ran and resolved not to be consumed. Babb, Montana, May 21, 2010–I’m standing here on a blustery day in Babb at the intersection of Hgy 89 and Glacier Road Three watching company trucks and employee cars making their way up Swiftcurrent Valley to get Many Glacier Hotel ready for its June 4th opening for the summer season. My ancient CJ5 complained about the trip all the way from Junction City, and both the Jeep and I are wondering if the 4-wheel-drive will work in tomorrow’s expected snowfall. 1. Except when I’m desperate for cash, I don’t do windows, Karaoke bars or book reviews. 2. I know diddly about Quantum physics, and that means that I don’t buy into the theory that everything that can happen does happen or that there are multiple universes connected to each other by time portals. 3. Magic is just smoke and mirrors and too many glasses of Scotch. So, let me dismiss out of hand, the rather rash claims by author Malcolm R. Campbell that there’s a real time portal hidden at the base of Mt. Allen at the head end of Lake Josephine that leads to another universe. If such a thing existed, everyone having “issues” with loan sharks, ex-wives and bad whiskey would be here in the park doing whatever voodoo chants or meditations were required to open that door so they could escape. Frankly, I think the whole time portal in the park occurred to Campbell years ago after he fell off the top of Mt. Allen and hit his head. If there were a time portal–and I’m not saying there is one–all those running through it might find themselves smack dab in an industrial-strength spot of bother. That’s what happens to young Robert Adams in the book. His family brings him to this beautiful park, and what does he do? He leaves the celestial world of hiking, boating, riding jammer buses and mountain climbing and steps through a doorway into a place filled with evil. Once he gets there, he forgets who he is. I know a lot of people in the psych ward over at county general who act like they’ve been there and done that, but the big difference is, they’re real people. Robert Adams is a fictional character who has to figure out how a magical wizard’s-type staff works just to get back to the hotel with his physical self all in one piece. Even though I had a few drinks while reading “The Sun Singer,” I didn’t totally believe in magic when I got to the last page. But I have to say, the novel tells a darned good yarn and when I sobered up, I considered getting a job in the quantum mechanics or avatar business so I could learn more about all the realities that yours truly appears to have been ignorant of up to now. Look, if you go to Glacier this summer, take a copy of the novel along and read it at night while spending your daylight hours celebrating the park’s 100th birthday. Just remember, Robert Adams goes looking for a time portal because he promised his mystical grandfather he’d do it and try to fix whatever was broken. What was broken included himself. So unless your life is too broke to fix, leave that portal alone. Or at least, read the book first and then decide where you stand on such things as magic and time portals and becoming a Sun Singer. As for myself, I need to find a warmer place to sleep tonight than a 40-year-old Jeep with a canvas top. I love locally owned independent bookstores. They’re not only great for a city’s economy–as websites like IndieBound will tell you–they are also a reflection of the local culture, people, reading habits and thought. When I reached handwritten postcard number 100 in the stack I’m sending out to bookstores telling them about “The Sun Singer,” I was curious about the store getting the postcard. It’s River Lights Bookstore, 2nd Edition on Main Street in Dubuque, Iowa. They have a website and a Facebook page, so it was easy to learn more about the store. They also have something else that chain stores can’t match: a wonderful historic building. The “Second Edition” in the store’s name comes from the fact that when the original store closed, some of the folks involved created a new store down town. 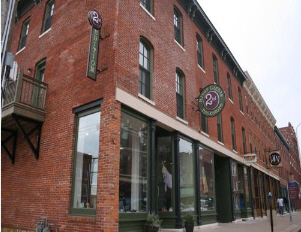 On June 1st, 2007, the new River Lights Bookstore opened in a beautifully renovated historic downtown building at 1098 Main Street. The wooden floors and tin ceilings of this 1870’s building offer an inviting atmosphere in which to browse or connect with fellow booklovers. As the former chairman of my town’s Historic Preservation Commission (HPC), I was happy to see the “adaptive reuse” of the old building. I wish the store would include a note on its site saying what the building originally housed. By the look of it, it could have been a small manufacturing operation. According to Dubuque’s website, the city has an HPC that oversees the historic districts and historic properties. Doing this is also good for the local economy; and, of course, it strengthens a community’s sense of its own past history and architecture. River Lights looks like what a bookstore ought to look like: a vibrant operation with excited book people in the perfect setting. If I lived in Dubuque–a three-hour drive from Batavia, the small town where my father was born–I would be shopping at this store every week. “Hmmm” is fine with me, assuming they can read my handwriting which, suffice it to say, was getting a bit sloppy when I reached card #100. Otherwise, I’m glad I looked up the store where the card is headed. For a preservation-minded writer, the website is a real treat, and imagining what it would be like to shop or attend book club meetings in River Lights 2/e is wonderful to imagine. Each copy sold benefits Glacier National Park! Vanilla Heart Publishing announced this morning that a portion of the proceeds from the sale of the new second edition of my novel “The Sun Singer” will be donated to Glacier National Park in support of the 2010 centennial program. The second edition, released February 25th, is primarily set in Glacier National Park’s Swiftcurrent Valley. A portion of the profits from the book’s trade paperback, Kindle and other e-book formats during March, April and May will be donated to the centennial committee. The National Park Service staff at Glacier National Park have provided me with a great deal of research information over the years, and with the second edition of “The Sun Singer” and the park’s centennial occurring during the same year, this was an opportunity to return many favors. In the novel, young Robert Adams and his family travel to Many Glacier Hotel, the area where his late, avatar grandfather grew up. As a family, they are there for the scenery and the experience. But Robert is there for something more: a mission to a look-alike crown of the continent in an alternative universe. When park visitors take the launch to the head end of Lake Josephine, they disembark at a pier next to a small lean-to. Many of them will hike back to the hotel, head toward Morning Eagle Falls and Piegan Pass, or stroll up to Grinnell Glacier. What these visitors do not see, unless they are as magical as Robert’s Grandfather Elliott, is the hidden cabin sitting there overlaying the lean-to, shimmering close at hand in another universe rather like Brigadoon in the Scottish Highlands. Within the cabin, there’s a door to another world, one closer to Robert’s family than he suspects and more dangerous than he can imagine. He must decide whether he has the grit and determination to step through that door and to turn his cursed psychic power into a gift in the service of others. In fact, his survival depends upon it. I worked at Many Glacier Hotel two summers as seasonal help (note photo of me in bellman uniform) and, while there, hiked most of the trails in the area and climbed many of the mountains. As the plot for “The Sun Singer” unfolded in my mind, I couldn’t think of a better location for the primary setting. Last fall, my article about the 1964 flood at Glacier appeared in the National Park Service centennial book “100 Years 100 Stories.” My essay “Bears, Where They Fought” about some of the stories flowing out of the park’s Swiftcurrent Valley is included in the soon-to-be-released Earth Day anthology from Vanilla Heart “Nature’s Gifts” (which helps support the Nature Conservancy). For me, the second edition of “The Sun Singer” is a dream come true. I hope you have a chance to visit Glacier National Park this year and take part in the centennial activities. It’s a magical place filled with cold running streams, turquoise lakes, National Register hotels, and mountains carved by ancient ice. Once you are there, you’ll find maps and guidebooks available for your hiking pleasures. While I hope you’ll read “The Sun Singer,” I don’t advise taking it to that lean-to at the head end of Lake Josephine. There’s a swirl of energy there that might interact with the book and carry you away on a longer journey than you intended. Recent Glacier posts in this blog include Bears Don’t Eat Beargrass and Glacier’s Historic Red Buses.